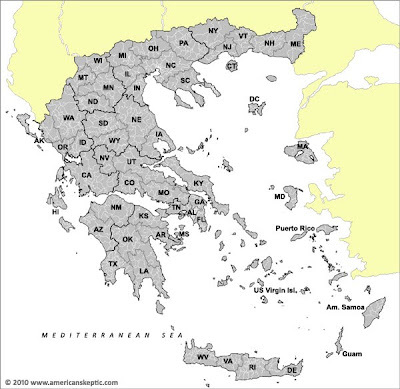 American Skeptic: The United States of Greece? The "health care" bill passed by the house yesterday was in fact, not a health care bill after all. It was, instead, the largest redistricting bill in recorded history. I present you with, the United States of America Greece. Update: After some backroom dealing, Nebraska negotiated itself some prime waterfront in the new plan.